Bio: Born and raised in Southern California, I retired to Henderson full-time in 2009 after a 30 year career in law enforcement. My passions in life are hockey, hiking, traveling, and photography! 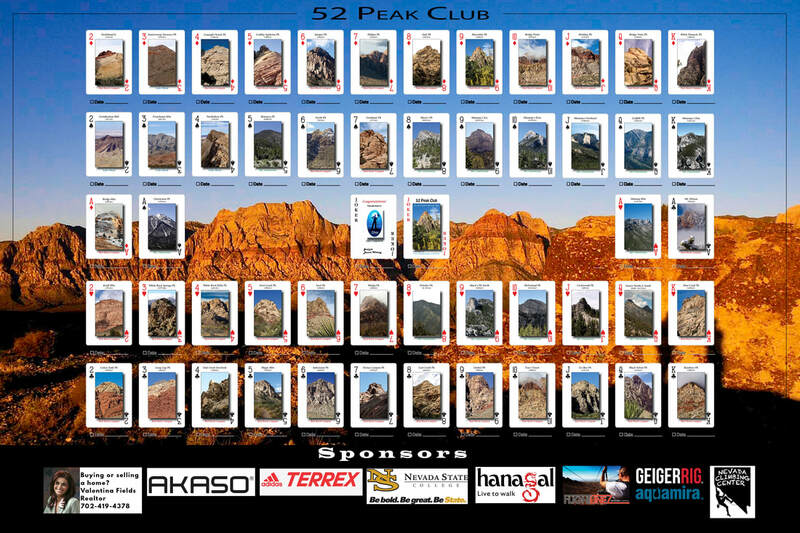 Why did you join the 52 Peak Club: I started hiking in Las Vegas with my cousin in September 2012. I had only been on a couple of trail hikes in my entire life, so I didn't know what to expect when he took me out to Red Rock. 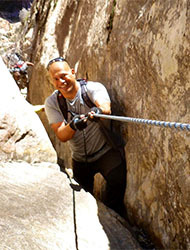 Based on his advice, I started hiking regularly with a couple of Meetup groups and I fell in love with scrambling. On these hikes, I started hearing about the 52 Peak Club and thought it sounded interesting. Initially, I didn't like the "commercial" concept of the club, so I decided not to join. Some new hiking friends ultimately talked me into joining, and I agreed to see what it was all about. I went on my first 52 Peak Club hike to Grey Cap Peak on December 30, 2012 and was hooked. Toughest Peak: It's hard to pinpoint one hike as the toughest, as there are varying degrees of toughness. Some were physically tough and some were mentally tough. We all have good days and bad days, and a bad day can make an easy hike extremely tough. Some hikes are tough due to distance, some due to exposure, some due to technical difficulty. For me, my most memorable difficult hikes were Mt. Wilson (bowl route), Frenchman's via the road (not fully recovered from the flu), and McFarland (just a miserable hike). How did you feel once you became a 53er: Honestly, I felt relieved, happy and proud. When I first joined, I was getting 2-3 cards a week. I finished half the deck in just over 3 months and was on pace to finish in 6-7 months. I had set a personal goal of finishing by my one year hiking anniversary and was well on my way. Then came vacations, fires, flooding, government shut down, etc., and it seemed like I would never finish my deck. The hikes I needed weren't being posted and it took two months to get my last 7 cards. I became very obsessed with finishing the deck and lost sight of the big picture of why I love to hike. I feel like a load has been lifted from my shoulders and I can get back to hiking for fun, rather than a card. Advice for new hikers: People hike for a variety of reasons and come from different levels of experience. My advice is from the perspective of someone that had never hiked before: Start slow and go on easy hikes. This will allow you to build confidence and understand your capabilities and limitations. Do things besides hiking to improve your fitness and strength level. Ask a lot of questions and make sure you get the proper equipment, especially shoes! Most importantly, don't lose sight of the big picture, have fun and take time to smell the flowers!